Dr. Nicole Weber has been with the Pipestone Veterinary Services since 2006. She grew up on a farm just north of Granite Falls, MN. She completed her undergraduate work at South Dakota State University and attended veterinary school at the University of Minnesota, College of Veterinary Medicine. Dr. Weber and her husband Jason are proud parents of a daughter Olyvia. In her free time, she enjoys spending time outdoors golfing, fishing and camping. Dr. GF Kennedy started at the Pipestone Veterinary Services in 1960 after graduating from Iowa State University's College of Veterinary Medicine. He is a nationally recognized sheep health and production expert. Dr. Kennedy's personal interests have always included raising purebred sheep, from Suffolks and Rambouillets to his current flock of Dorpers and Katadins. In addition to lambing ewes in his spare time, he and his wife Deb enjoy hunting, fishing, and raising dogs, cats and birds on their farm near Pipestone, MN. Dr. Gordon Spronk is a native of the Pipestone area. After completing Veterinary College at the University of Minnesota in 1981, he returned to Pipestone to practice with Dr. Kennedy at the Pipestone Veterinary Services. Dr. Spronk was the co-founder of the "Pipestone System" of pig production. Dr. Spronk and his wife, Deb, live near Pipestone and have three children, Courtney, J.J., and Morgan. In his free time, Dr. Spronk enjoys traveling and spending time with his family. ​Dr. J. D. Bobb is a native of North Dakota. After growing up on a sheep farm, Dr. Bobb attended North Dakota State University and Iowa State University where he graduated from the ISU College of Veterinary Medicine in 1990. After graduation, he started at the Pipestone Veterinary Services with interest and expertise in sheep reproductive physiology and artificial insemination. Dr. Bobb and his wife, Cindy, have three children, Lacy, Josh and Julie. They enjoy living on a farm near Pipestone and raising their children, tending to their horses and a flock of Rambouillet ewes. Dr. Barry Kerkaert is a native of southwestern Minnesota and started at the Pipestone Veterinary Services after graduating from the College of Veterinary Medicine at the University of Minnesota in 1994. Dr. Kerkaert has become a well respected swine veterinarian and production consultant throughout the upper midwest. Dr. Kerkaert and his wife, Karen, have three children, Hayden, Jenna and Aubrey. ​Dr. J. Larry Goelz grew up on a diversified livestock farm in southwestern Minnesota and joined the staff at the Pipestone Veterinary Services in 1996 after graduating from the University of Minnesota College of Veterinary Medicine. In his spare time, Dr. Goelz enjoys spending time with his wife, Lori, and daughters, Brooklyn and Kaitlyn and son John "Jack" on their farm, raising Limousin cattle, Collie dogs and a few horses. Dr. Luke Minion grew up in southwestern Minnesota and began his career with the Pipestone Veterinary Services in 2000 after graduating from the University of Minnesota College of Veterinary Medicine. Dr. Minion's areas of interest include production animal medicine, management and serving as the CEO for the clinic and other related businesses. Dr. Minion and his wife, Betsy, enjoy golfing and keeping up with their son, Landon and twin daughters Claire and Lauren. Dr. Spencer Wayne is originally from Albert Lea, MN. He attended the University of Minnesota College of Agriculture and later the College of Veterinary Medicine before graduating in 2001. 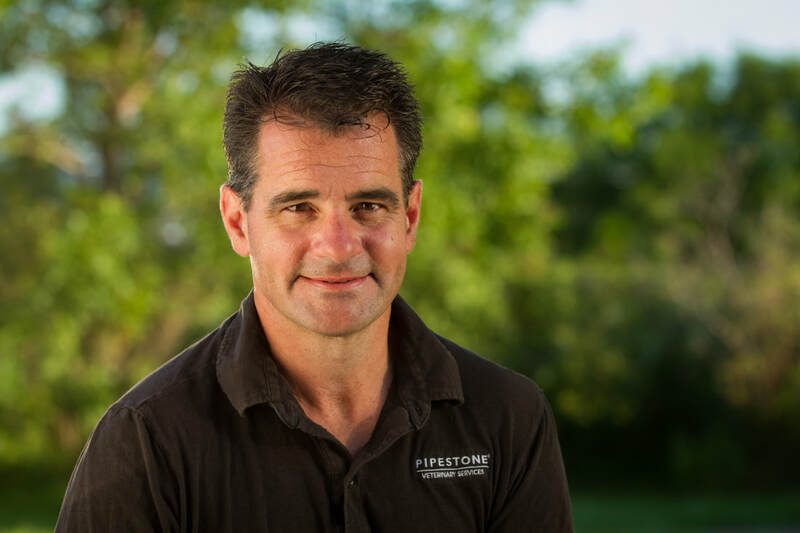 Dr. Wayne earned a PhD from the University of Minnesota in 2008 and joined the Pipestone Veterinary Services staff full time. Dr. Wayne's area of interest is Swine Disease Epidemiology with special focus on the geographic spread of PRRS virus. Dr. Wayne and his wife, Suzanne reside in Pipestone with their two daughters, Ava and Molly. Dr. Joel Nerem joined the Pipestone Veterinary Services staff in July 2006, and comes with solid swine health experience. The West Union, Iowa, native launched his career at the Postville Veterinary Clinic in Postville, Iowa. He's a graduate of Luther College in Decorah, Iowa, and earned his DVM at Iowa State University in 1995. Joel and his wife Denise and their children Emily, Hannah and Maren live in Edgerton, MN. Dr. Carissa Odland is a graduate from the University of Minnesota- College of Veterinary Medicine and joined the Pipestone Veterinary Services in 2009. Dr. Odland is originally from Saint Peter, MN where she grew up on a sheep farm. Dr. Odland resides in Rural Pipestone with her husband Isaac. Dr. Brett Kroeze, a 2012 graduate of Iowa State College of Veterinary Medicine, brings his family values of hard work and commitment to providing outstanding service to area clients. Growing up, Dr. Kroeze spent as much time as he could on his Grandfather's dairy farm near Hull, Iowa. Dr. Kroeze's grandfather was his mentor and taught him the values he treasures today. Dr. Kroeze and his family are making their home in Edgerton, Minnesota. Dr. Adam Schelkopf is from Dekalb, Illinois and graduated from the University of Illinois College of Veterinary Medicine in 2012. He joined Pipestone Veterinary Clinic in June of 2012 after graduation and lives in Edgerton, MN. His primary interest is in swine health and production. Outside of work, Adam enjoys many outdoor activities, especially hunting and golfing. Dr. Scott VanderPoel grew up on a farm just south of Pipestone, MN. Throughout high school and college, he worked as part of the customer service team and assisted veterinarians out in the field. Dr. VanderPoel graduated from South Dakota State University with a degree in animal science, and then perused his DVM degree at the University of Minnesota. He currently works a as swine veterinarian for Pipestone Veterinary Services and Pipestone System. Dr. VanderPoel and his wife, Jessie, have enjoyed moving back closer to family with their three kids, Drake, Neva, and Renae. Dr. McDowell received her D.V.M. in 2011 from Iowa State University. Emily strives to promote the swine industry, optimize productivity and sustainability, and shape the safety, quality, and consistency of our food supply. Emily grew up on a grain and livestock farm near Primghar in northwest Iowa. Emily?s knowledge and personality is a great addition to Pipestone Veterinary Services and Pipestone System. ​Though she was born and raised on a dairy farm near Holland, MN; Katie grew up to focus her attention beyond production agriculture: her specialty is companion animal care. Pets and their owners who visit the Pipestone location have learned to trust Katie who has been a small animal veterinary technician there since 1997 and joined the clinic in 2005. ​Growing up in Pipestone, Teri showed cattle and horses and was active in 4-H. She attended the University of Minnesota - Waseca, earning a degree in Light Horse Management and an Animal Science major. Teri joined the Pipestone vet clinic in 1995. She lives with her husband and daughters. The family has two horses, two dogs, and one cat.